A couple of weekends ago, Stairwell Guy (Jeff) and I decided to head over to Brady Street for dinner. After sending a tweet to my younger (and cooler) coworker, Alex, we decided to head over to Bosley on Brady on his recommendation. If I recall correctly, we had played a little tennis earlier in the afternoon and found ourselves to be famished by 5PM! Needless to say, we didn’t have to wait for a table and in fact had our pick of the outside seating. It was a beautiful afternoon, so sitting outside was the obvious choice! We were quickly and warmly greeted by Skip, our server. He gave us a brief overview of the place, including highlighting that Bosley on Brady is essentially a Florida Keys-influenced restaurant. The back story on their website explains a bit more about that. Skip also proved to have a great sense of humor and was very personable throughout our dinner. We perused the menu, and everything looked so delicious! I decided to let Skip choose my dinner and a drink to go along with it. He read my card, and quickly affirmed that he had great choices in mind. 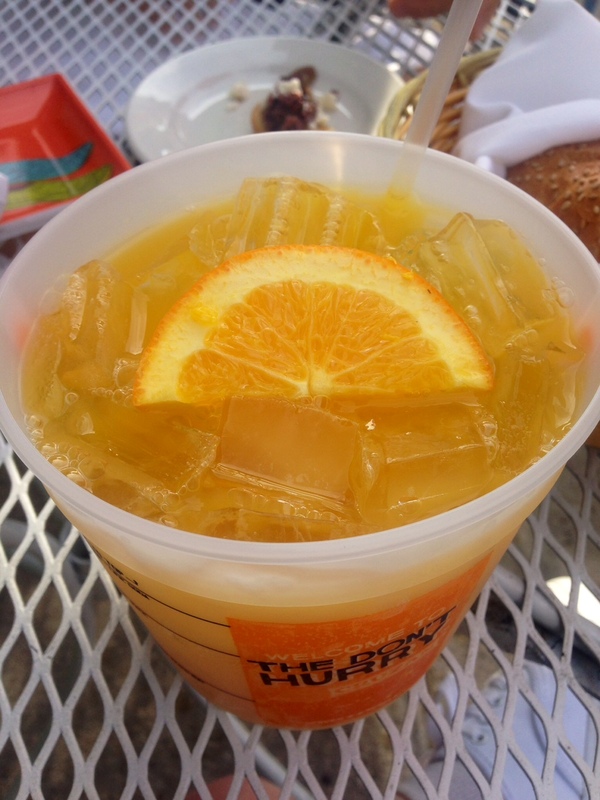 Skip delivered “the mango tango” cocktail (in a bucket!) to me. Although I typically don’t drink hard liquor, I put my trust in Skip (and also advised Jeff that he might have to carry me home!). It was refreshing on a warm evening! Mango puree, rum, mango vodka, and orange juice. Jeff and I decided to order an appetizer sampler (which we devoured before I thought to take a picture). We also ordered the watermelon salad (a favorite of mine!). 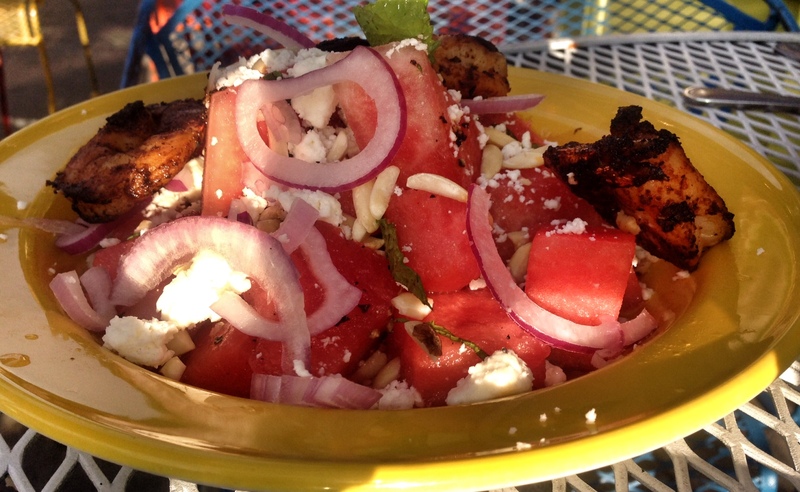 How can one not enjoy watermelon covered in feta, mint, red onions, toasted almonds, cracked pepper, olive oil and blackened shrimp? Although we certainly weren’t in a hurry that evening, I will say that we both though the food service was a bit slow. Eventually, we received and enjoyed the salad, and then we moved on to our entrees. Jeff chose the scallop dish (he knows I can’t have scallops, but that I think they’re fantastic! They are one of his favorite dishes as well). 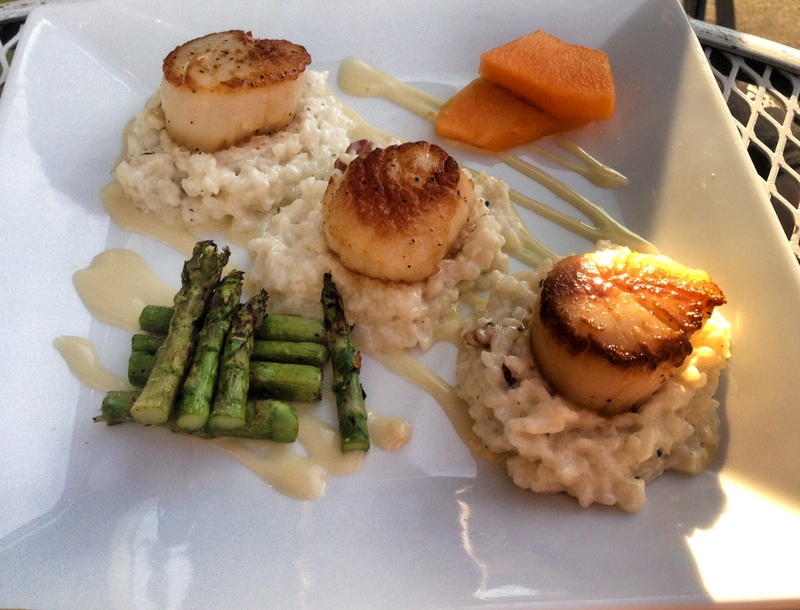 They were served on a delicious risotto and with Jeff’s other favorite: asparagus. Needless to say, he enjoyed the meal. Skip had decided to bring me the special of the evening: Cobia. A solitary fish that feeds on other fish, giving it a really intense flavor. 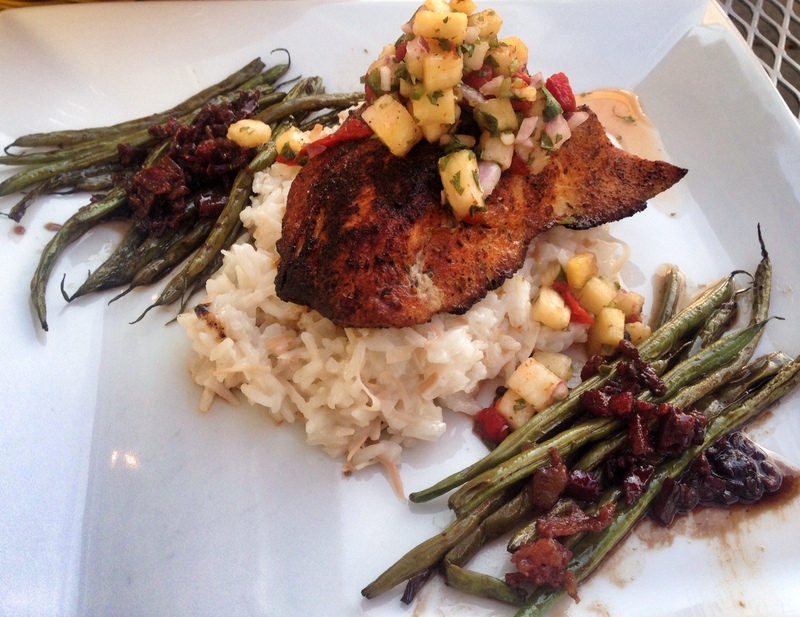 This too, was served over risotto and with a mango salsa. The green beans had a wonderful caramelized bacon on them as well. Very good combination of flavors, although I couldn’t finish my meal. I mean, look back at how much we had already eaten! Jeff decided to take my leftovers home, so they certainly didn’t go to waste! There was no way we were going to try dessert after that gluttonous dinner! However, I am certainly not opposed to going back to Bosley on Brady for a lighter dinner and possibly trying dessert. If you’re looking for a leisurely dinner on the east side, I’d suggest heading over to Bosley on Brady. Oh boy oh boy, this look absolutely delicious! I’ve only been there one time and was not disappointed, definitely feel like I (and you and I!) need to check it out sometime soon! Sounds like a great plan to me, Phi!